1 of 4 Heat oven to 450 degrees F. Coat two baking sheets with nonstick cooking spray. 2 of 4 Place cabbage on one prepared baking sheet, and onion and carrots on the second baking sheet. Brush with olive oil and season with 1/2 teaspoon of the salt and 1/8 teaspoon of the pepper. Roast vegetables at 450 degrees F for 20 minutes; rotate pans and roast for an additional 15 minutes. Drizzle with vinegar during last minute of cooking. 3 of 4 Meanwhile, heat a grill pan over medium-high heat. Season the pork with the remaining 1/4 teaspoon salt and 1/8 teaspoon pepper and grill for 2 minutes per side or until cooked through. 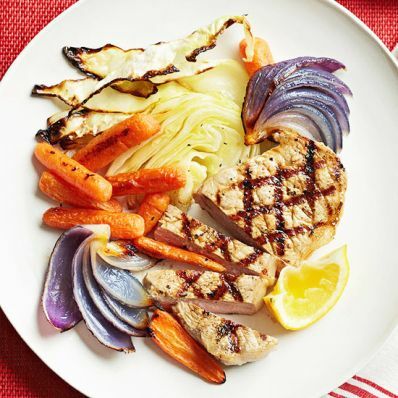 4 of 4 To serve, place the pork on individual plates and arrange vegetables over the top. Squeeze lemon over servings, if desired. Per Serving: 34 g pro., 413 kcal cal., 17 g Fat, total, 30 g carb., 9 g fiber, 605 mg sodium, 4 g sat. fat, 88 mg chol.